From PJ Media, by J. Christian Adams, 06/17/13 – Something perverse happened after the Supreme Court’s decision today invalidating citizenship-verification requirements in Arizona for registrants who use the federal voter registration form. The Left knows they lost most of the battle, but are still claiming victory. That’s what they do. Election-integrity proponents and the states are saying they lost, but don’t realize they really won. Earlier today, I called the decision a nothingburger. After re-reading the case and reflecting a bit more, it’s clear that the decision was a disaster for the Left and their victory cackles are hollow — and they know it. Worse, conservatives dooms-dayers who have never litigated a single National Voter Registration Act case have taken to the airwaves, describing the case as a disaster which invites illegal-alien voting. ● Invalidation of Arizona’s requirement that those submitting a federal form provide proof of citizenship with their federal form. Mind you, the citizenship-proof requirement is NOT part of federal law and the Election Assistance Commission does NOT require it in the form they drafted. ● Invalidation of state citizenship-verification requirements when a state voter registration form is used (yes, such forms exist separate from the federal requirement) on the basis of federal preemption. They wanted the Arizona case to invalidate all state citizenship-verification requirements. ● Automatic registration if a registrant submits a completed federal EAC approved registration form, no questions asked. ● Federal preemption on the ability for states to have customized federal EAC-approved forms that differed from the default EAC form. ● Federal preemption over states, like Florida and Kansas, looking for independent information on citizenship to root out noncitizens from the voter rolls. Again, the Left wanted the federal EAC form to be the no-questions-asked ticket to the voter rolls. How does it work? The decision today uncorks state power. The Left wanted state power stripped and they lost. First, Arizona can simply push the state forms in all state offices and online, and keep those federal forms in the back room gathering dust. 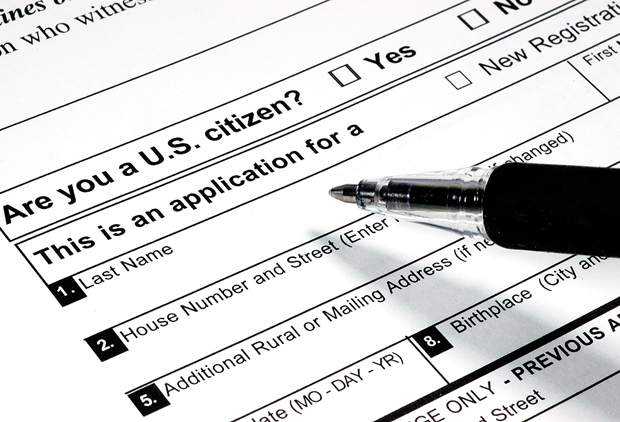 When you submit a state form, you have to prove citizenship. Thanks to Justice Scalia, that option is perfectly acceptable. Loss for the Left. Victory for election integrity. You might say, “That’s a small victory.” Nonsense. This was the whole ballgame to the groups pushing the Arizona lawsuit. They lost, period. Next, when voters use a state, as opposed to a federal, form, they can still be required to prove citizenship. The federal form is irrelevant in that circumstance. After the decision today, states have a green light to do double- and triple-checking even if a registrant uses the federal form. The Left wanted the submission of a federal form to mean automatic no-questions-asked registration. This is a big loss for the Left because now states can put suspect forms in limbo while they run checks against non-citizen databases and jury-response forms. Another significant victory in today’s decision. The Left wanted to strip them of that double-checking power. The decision today is a great example of how conservatives can be distracted by squirrels running past. It is understandable and forgivable because they aren’t daily immersed in the long-term election-process agenda of the left-wing groups. Nor do they daily involve themselves with the details of election process. But having been in the “preemption wars” for nearly a decade, I can assure you this case is a big win, even if it doesn’t appear so at first glance.